1-10 –DJ Promo* Shut Up! 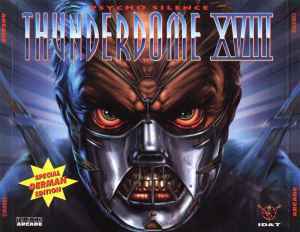 This is the big box version of Thunderdome XVIII German Edition. Some includes a free keyring. The thin box version can be found here. 1-01 and 1-07 are listed without any mix information. 2-01 was released as "Dreamteam = Back" by DJ Buzz Fuzz on vinyl. 1-15 samples the movie "Apollo 13" (1995). 2-05 samples "Kickin' In The Beat" by Pamela Fernandez. 2-19 is credited to DJ Jappo.